WB Yeats may have written one of the greatest poems about aviation in An Irish Airman Foresees His Death. But even auld Willie would have struggled to do justice to the legends of bonkers aviation heroes Douglas "Wrong-Way" Corrigan and Mad Tommy Fitzpatrick, two Irish-American pilots who took to the skies with a sense of adventure and illegality. 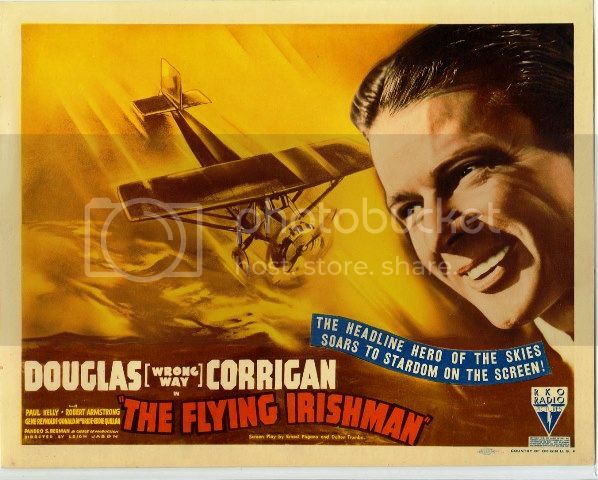 Corrigan was by far the most famous - flying solo across the Atlantic "by mistake" in a tiny plane in 1938 (it later emerged that there may have been some method to his madness). Corrigan left New York with a flight plan for Los Angeles, only to end up two days later in Dublin, eventually returning back to New York for a ticker-tape parade down 5th Avenue. Tommy Fitz was not so well-known, he just liked to make drunken barroom bets involving stolen planes and madcap landings on Manhattan avenues. For our first Hero of the Skies, Corrigan, it all started at 5:15 in the morning on July 17, 1938, when the then 31-year-old aviator walked out onto the tarmac of an airfield in Brooklyn, New York, climbed into the cockpit of his plane, and made for the skies, bound for Los Angeles. It was the days before civil radar systems and pilots would use a mix of dead-reckoning (using maps, visual markers and complicated sums involving airspeed & wind) to make out where they were going. They also radioed in regularly to check their position. Aviation was a decidedly seat-of-the-pants affair, sometimes dangerous and always unpredictable. Fog, for instance, could be fatal and it was not uncommon for pilots to drift way off course and never be heard from again. Thus was the Legend of Wrong Way Corrigan born (the newspaper man who came up with that nickname probably got a few drinks that night) and the genial Irishman became an overnight, international sensation. It was a little over ten years since Charles Lindbergh made the first solo crossing of the Atlantic in the Spirit Of St Louis. And by any measure, Corrigan's journey in a jury-rigged, single-engined plane was just as miraculous. He was either brilliantly skilled or brilliantly lucky. Maybe both. Corrigan's easy charm and modest "aw shucks" demeanor endeared him to a world looking for heroes and the newspapers and newsreels went nuts (check out the clever backward headline in The New York Post - celebrating Wrong Way's epic, backwards achievement). Corrigan swore blind that it had been a simple mistake - he meant to fly west but got turned around in the fog and headed east to his ancestral homeland instead. With a bit of Blarney, he told how he had been betrayed by a faulty compass and absentmindedly wandered off to Ireland without ever bothering to check the lay of the land below him. However, it later emerged that Wrong Way - after crossing the US in his (almost) home-made plane (bought for €310 dollars and modified by himself) - had applied several times for permission to fly solo across the Atlantic. The civil aviation authorities took one look at his just-about-held-together aircraft and said no. Corrigan had cobbled together his own, dangerously overpowered engine from two old ones. It was so big, he couldn't see out of the cockpit. His door was held in place by bailing wire. There was no way they were going to let this maniac fly across the Atlantic in THAT. But the former barnstormer & cropduster was determined. He had actually help build Lindbergh's Spirit of St Louis and pulled the chocks out from the wheels before it taxied off into history on May 20th, 1927. He had already applied several times for permission to fly the Atlantic in his own ship. And if the authorities wouldn't give him permission, well, he could always blame a faulty compass. Strangely, his story of flying solo across the Pond by mistake caught the public's imagination and made him more famous than he could ever have hoped to have been just for flying the "right" way. Corrigan knew exactly what he was doing as he headed off into the clouds over Brooklyn. And in the bargain, he set a new record, despite a leaky fuel line that made the crossing even more perilous than it already was. The American public winked along with Corrigan. He earned a tickertape parade in New York, public appearances, a book deal, a movie contract, and a few celebrity endorsements, including one for a pocket watch that ran backward. By the time World War II began, the commotion surrounding him had quieted, and Corrigan worked as a test pilot and freight transporter. He later bought an orange grove outside Los Angeles. He was all but forgotten afterward, and when he was invited to display his famed plane at an aircraft show in 1988, he grumbled that he would take him a lot of work to do so—he had taken it apart and had been storing it in his garage since 1940. Toward the end of his life, Douglas Corrigan is said to have quietly admitted that his trip hadn’t been a wrong-way adventure after all. However, even in his last months—he died on December 9, 1995, at the age of 88—Corrigan never said anything other than that fog and a bad compass had been kind enough to give him a small measure of fame in his day. *****Corrigan's slightly crazier descendent was Tommy "The Mad Marine" Fitzpatrick, the Airborne Terror Of Manhattan. The bould Tommy, an Irish-American veteran of the Korean war, pulled off what ranks as two of the most spectacular barroom bets off all time - in the '50s. In 1956 and again in 1958, Tommy twice rose from his barstool in Washington Heights, New York, announced he would be back shortly, and disappeared off into the night (and New Jersey) to find a plane. On both occasions, he hot-wired the aircraft, took off and piloted them towards the bars he had recently been drinking in. Landing on city streets amidst the canyons of Manhattan and nonchalantly taxiing up to the door of the bar. 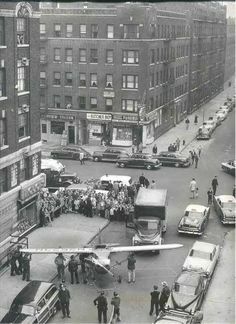 At 3am on September 28th, 1956, he stole a a plane from a New Jersey airport and landed it on St. Nicholas Avenue in northern Manhattan, in front of the bar where he had just been drinking. And just to prove that was no fluke - Mad Tommy did almost the exact same thing two years later. Both landings were pulled off in incredibly narrow landing areas, in the dark – and after a night of hard drinking in Washington Heights taverns. Both times ended with Mr. Fitzpatrick charged with wrongdoing. The second time around, he was jailed for six months by an exasperated judge. The first of his flights started in a stolen, single engined plane at he Teterboro School of Aeronautics in New Jersey. Tommy took off without lights or radio contact and landed on St. Nicholas Avenue near 191st Street. The New York Times called it a “fine landing” and reported that it had been widely called “a feat of aeronautics.” He got off with a small fine. The second flight was on Oct. 4, 1958, just before 1 a.m.
Again he took a plane from Teterboro and this time landed on Amsterdam & 187th Street in front of a Yeshiva University building after having “come down like a marauder from the skies,” in the words of judge at the subsequent trial. Newspapers reported that Mr. Fitzpatrick jumped out of the landed plane wearing a gray suit and fled, but later turned himself in. Mr. Fitzpatrick told the police that he had pulled off the second flight after a fellow drinker refused to believe he had done the first one. Perfectly reasonable, really. That first flight, Mr. Fitzpatrick later admitted, was the result of a barroom bet. He had wagered with a fellow drinker that he could leave the bar, go to New Jersey, and then get back in 15 minutes. And he did. Tommy died in 2009 at the age of 79, apparently a character to the end. At his funeral, one of his old buddies admitted the former Marine had "a bit of a crazy side". Today Tommy would be called Tommy The Terrorist and flown directly to Guantanamo bay for a long Vacation! They wouldn't hold him for long!